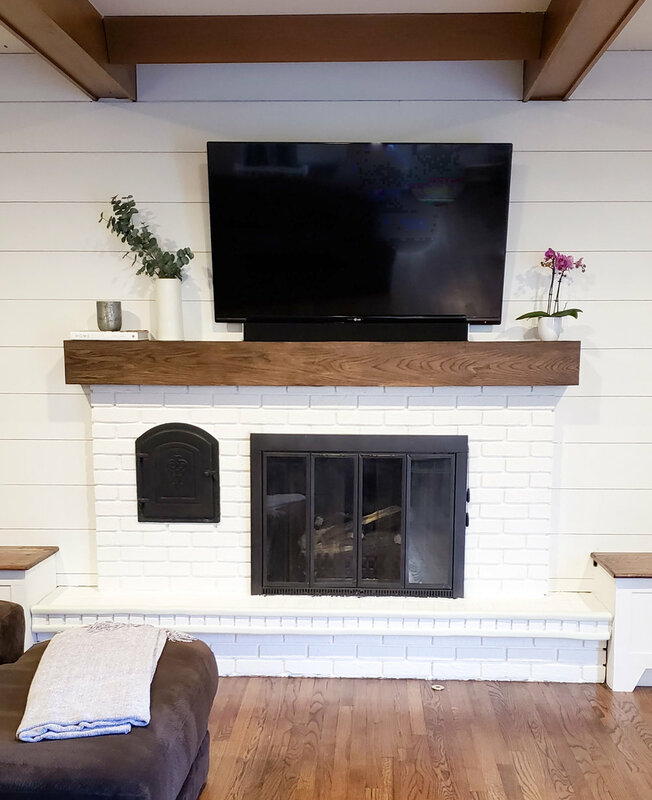 Our latest project was a major face lift in our family room. Once we did the entire wall we quickly realized that we needed to paint the fireplace a matching color! I was originally going to do more of a white wash, but we decided that we both liked the solid paint look a little better. This project only took about a day to complete (we did two consecutive nights), but if your fireplace is really dirty, you might need to take more time to clean it. This is a simple solution to give the fireplace a quick makeover without having to re-do the entire thing! I spent about $40 on this project, so something well worth it to me! Most of these materials can be found at your local hardware store, but I’ve linked the products we used on amazon for a reference! The first step is to clean the fireplace as well as possible. I started with the wire scrub brush to get out any debris I could and since we had just re-done the wall, there was a lot! Then, I used warm water with a small bit of dish soap and the sponge to get the brick nice and clean. If I’m being completely honest, ours was really dirty and was not 100% perfect before we primed. We just did the best we could! Prime the brick with latex primer (I read Latex is better for brick!). Use the roller to prime the brick and if necessary, fill in gaps with a regular brush. Let dry and apply second coat based on the directions on the can. Paint fireplace with a roller and brush to get in the grooves. We used Valspar Dove White. Another way to really make a statement with your fireplace is to paint the door. We didn’t want to spend money replacing the door, so we decided to just use spray paint. It was so easy and cost like $8. We also built a new mantel for the fireplace, here is a good tutorial similar to what we did! Here are some more photos of the final product!